Special Containment Procedures: SCP-4233-1 is located inside a high-security anomalous object chamber at Site-81 with a single ceiling light with a brightness of 35 lux, directly illuminating it. In case of a Phobetor Event, the shutters of the chamber's viewports are to remain closed with a single D-Class inside the chamber. During this time, all video surveillance within the chamber is to be turned off with the exception of the audio recording equipment located inside to monitor the actions of SCP-4233-2. Under no circumstances are personnel be allowed to look inside the chamber during this time. Description: SCP-4233 refers to two anomalous objects, SCP-4233-1, and the entity that resides within, SCP-4233-2. SCP-4233-1 appears to be a standard, pendulum-regulated cuckoo clock1. SCP-4233-1 bears no unusual properties other than its inability to sound the hours with a common cuckoo's call. SCP-4233-1 houses an entity within, hereafter referred to as SCP-4233-B2. Should SCP-4233-1 undergo its Phobetor Event, under low-light conditions, SCP-4233-1's shadow underneath will slowly begin to elongate and change form until it emerges into the solid entity known as SCP-4233-2. SCP-4233-2 is a dark, humanoid entity with seemingly polymorphic capabilities, described as "a man made out of shadow" by eyewitness accounts. SCP-4233-2 is often described as a tall figure with elongated arms and legs. SCP-4233-2 is said to wear a brimmed hat and coat with glowing eyes and acts in a humanlike manner. An accurate description of SCP-4233-2 is impossible due to the multiple iterations of the entity that exists within witness testimonials3. SCP-4233-2 only emerges during the start of midnight (12:00 AM) and ends at approximately 5:30 in the morning, this time period is hereafter known as "Phobetor Events". If SCP-4233-1 is exposed to direct light past midnight, a blackout of the room it is located in will occur and spread throughout the entire building it currently resides in. Afterwards, SCP-4233-1 will disappear from its original location; reappearing elsewhere and replacing a wall clock within a darkened room in the building with itself45 This effect is immediate as it lasts five to nine seconds depending on the size of the building it is contained in. If there is more than one source of light hitting SCP-4233-1 or the source of light exceeds past 45 lux, a blackout will occur, with SCP-4233-1 vanishing and reappearing elsewhere6. During a Phobetor Event, SCP-4233-2 will begin emerging from SCP-4233-1 as the source of illumination hitting SCP-4233-1 grows dimmer7. Once the room becomes dark, SCP-4233-2 will appear from the front of SCP-4233-1 and approach the subject. In this process, the room that SCP-4233-2 appears in will be devoid of all sound except for SCP-4233-2 itself. Survivors claim to hear SCP-4233-2's footsteps and are unable to move or react during this process with SCP-4233-2 leaving no trace of the victim behind other than whatever clothes they wore. This also extends to any inorganic material present within the subject such as piercings, dental fillings, and prosthetic implants. Addendum 4233.1: List of SCP-4233-2's forms taken during Phobeter Events. Popular artistic depiction of the entity referred to as the "Hat Man", image widely circulated online. Entity is believed to be SCP-4233-2. Artistic recreation of SCP-4233-2 as described by various sources. Image deemed an inaccurate representation of the entity. The contents of this list were taken from survivors of these Phobeter Events. All survivors of these events have been diagnosed with Schizophrenia following a checkup of their mental health. Abigail Sammis, age 22 Subject reported waking up at 11:55 AM to go the bathroom. Subject reported a sense of unease from the open door of her bathroom. Entity described as a tall, dark, and emaciated man with the arms and legs terminating in sharp points. 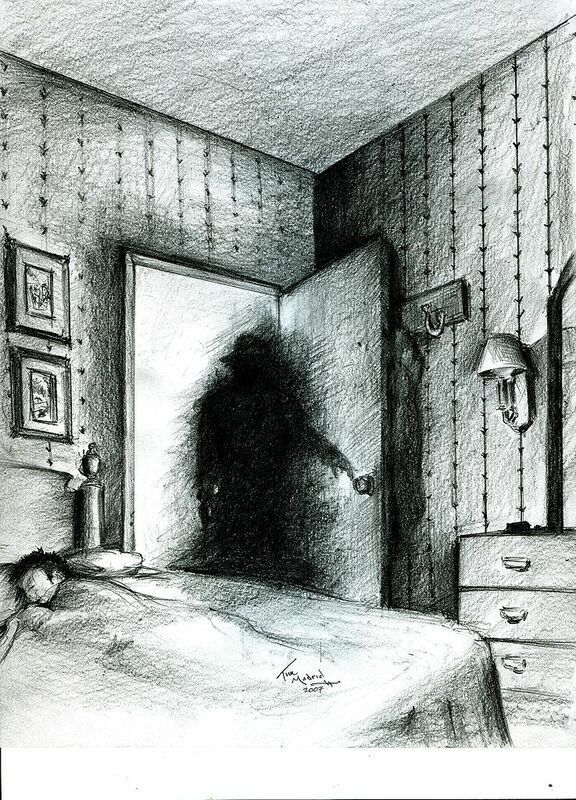 Subject claimed the entity stood "too tall to see" over the door frame. Subject couldn't move from the toilet for over 10 minutes before the entity vanished. Leon Mallick, age 38 Subject reported his left leg cramping in the middle of the night. Subject saw the entity from the ceiling of the bedroom. Entity described to take up the entirety of the bedroom ceiling. Entity made out of flesh with a dark purple color. Entity was said to have an upper torso emerge from the mass of flesh with an elongated head with "too many eyes" irregularly placed around the head. Subject described that the entity was "smiling" despite lacking a mouth to do so. Joshua Leilander, age 19 Subject was watching television when he reported the entity looking at him from the corer of the room, behind the television set. Entity described wearing a long coat and hat. Subject claimed that the entity removed it's jacket and a dozen black hands emerged from the mass and covered the back wall and television screen before it disappeared. Alexia Smith, age 16 Subject sitting at the side of her bed looking at the closet mirror. Subject did not see the entity directly, but only through the reflection of the mirror. Entity could only be described as a "dark, smoking man with small white eyes." Subject claimed the entity slowly reached a "hand" to touch her shoulder. Subject described the touch as "something so cold, it burns." and claimed that she screamed for her mother from her room. Entity vanished five minutes later. 1. A clock of German and Austrian make that strikes the hours with the call of the common cuckoo bird. 2. It is unknown whether this property is due to the automated mechanism to produce this call being broken or a factor in SCP-4233-1's anomalous nature. 3. It is currently unknown whether SCP-4233-2 is capable of physically changing form or shape. 4. The method of how SCP-4233-1 chooses which clock to materialize in its place is unknown and appears to be random. 5. If there are no wall clocks available in the structure, SCP-4233-1 will instead replace the nearest time keeping device inside. This includes standing clocks, watches, and even electronic devices such as computers, laptops, and mobile phones. 6. This effect also extends to observation of SCP-4233-1 once it passes midnight. 7. Lights within the chamber have been known to go as low as 3 or 5 lux.